1. The Complimentary, Girlie Doormat! The valley girl accent made popular by so many movies rings loud and true in the words of this doormat. There’s a reason you’re hearing that. The funny, pop culture reference is unmistakable. This doormat includes a Regina George quote from the movie Mean Girls. 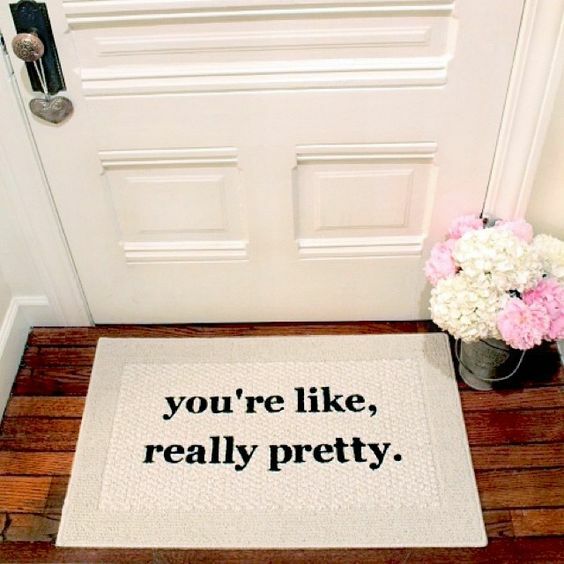 “You’re like, really pretty.” is written in bubbly script across the center of this off white floor mat. It’s the perfect accent for your first apartment or dorm room. And it makes a great decorative piece for any movie buff who loves Tina Fey comedies. 2. Directions for Life – A Doormat That Tells You Where to Go! Have you ever gotten home from a long day at work and settled in for a nice glass of wine? Or a bottle of wine? Well, this doormat will remind you which activity you’re heading to. “Work” is written on one corner with an arrow pointing toward the outside world. “Wine” is printed on the other corner with an arrow pointing toward your door. Let there be no mistake – your home is a sanctuary and that peace includes good wine. This is a great decorative piece for anyone who enjoys a little revelry or just really likes their vino. Just make sure you don’t turn the directions around. Wine instead of work would be fine. But work instead of wine would be horrible. 3. All Guest are Welcome but Guest With Pizza are Revered! This great doormat shouts a joyous, “Welcome!” to everyone who comes to your door. It follows that greeting with the very heartfelt, “I hope you brought pizza.” Who can argue with that? Do you know anyone who doesn’t like pizza? For those who love great food and like good humor, this doormat covers all your bases. It features a clean design and clear letters. This doormat offers a great conversation piece that all of your friends and family will enjoy. And they may just subconsciously get the urge to bring you pizza. Stranger things have happened. 4. Jesus Lives Here and so Does Coffee! Having a spiritual side doesn’t mean you can’t have a great sense of humor. 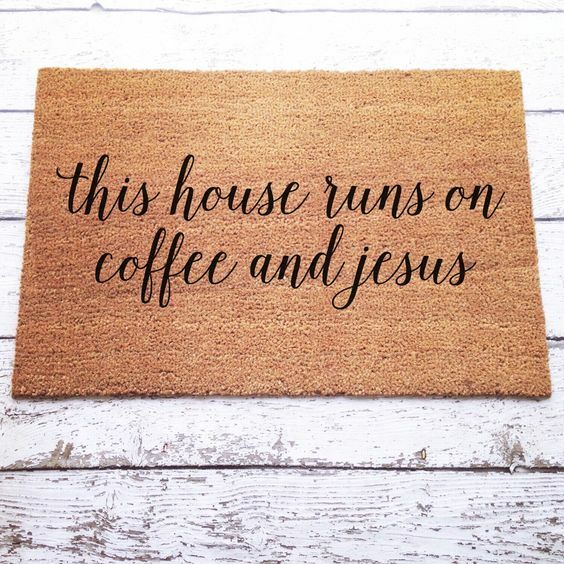 This doormat reads, “This house runs on coffee and Jesus”. It’s an honest statement if you want to give credit where credit is due. It features an elegant script and a simple design, but the words are universal. Everyone needs a little help to get through their days. Jesus can lead you in making decisions. But it’s pretty hard to get moving without coffee! This is a great doormat for anyone whose faith is just as important as their laughter. 5. Doormats That Double as Home Security! Want to keep your house safe from burglars? Let them know there’s better loot next door! 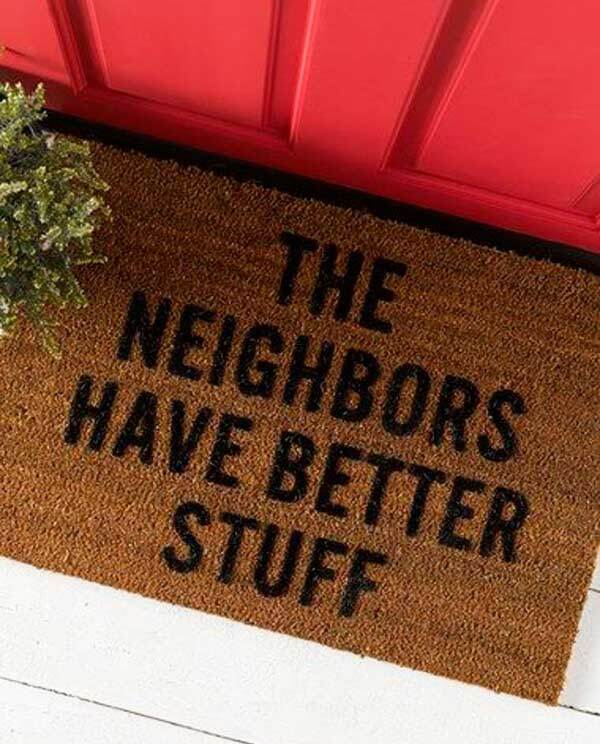 This doormat says, “The Neighbors Have Better Stuff”. It’s printed in clean block letters, centered across the mat. It would be really hard to miss the meaning of this message, even in the dark while you’re trying to pick the lock. Plus, your visitors will find it pretty amusing. Well, the neighbors might not like it as much as you do, but still. 6. Doormats That See Through Clothing! Okay, not really. 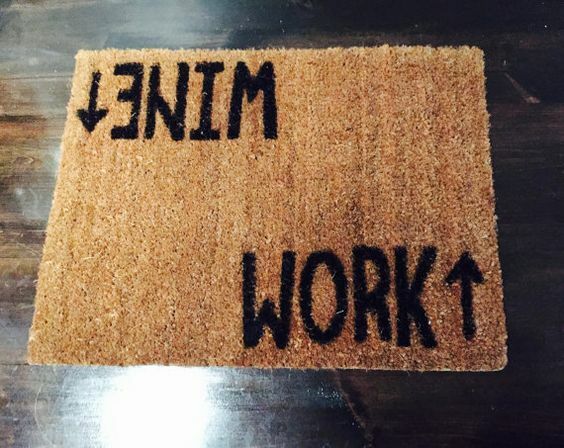 But this humorous doormat gives your guests an unexpected greeting, to say the least. “Nice Underwear” states the clear, block letters. The mat is bordered with bold straight lines and a square in each corner but the lower right. There’s a pelican design on the right hand side, giving just the right amount of wacky flair. Is the doormat looking up my skirt? Can it see through clothes? Probably not. But it definitely made you stop and think about what color underwear you put on this morning. 7. A Doormat That Tells the Honest Truth! What’s the best thing about a day off of work? Why, not needing to wear pants, of course! This humorous doormat tells your guests just how you feel about the formalities of the world outside. 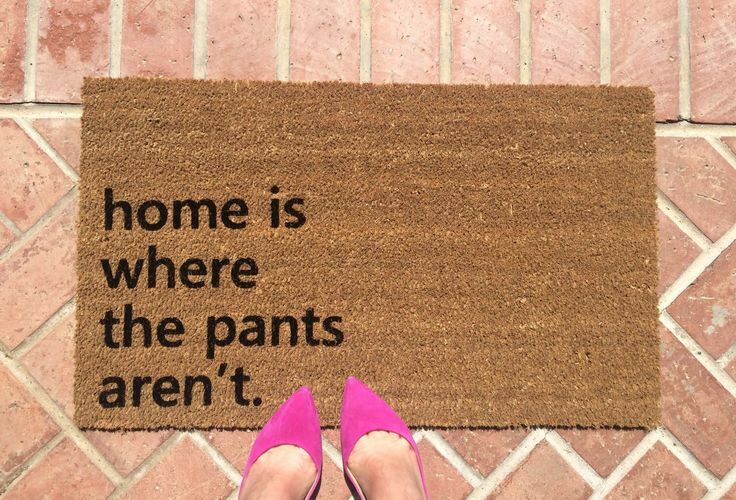 The phrase, “home is where the pants aren’t” is printed in lowercase letters on the left hand side of the mat. After all, who wouldn’t rather walk around with their pants off and be comfortable? 8. 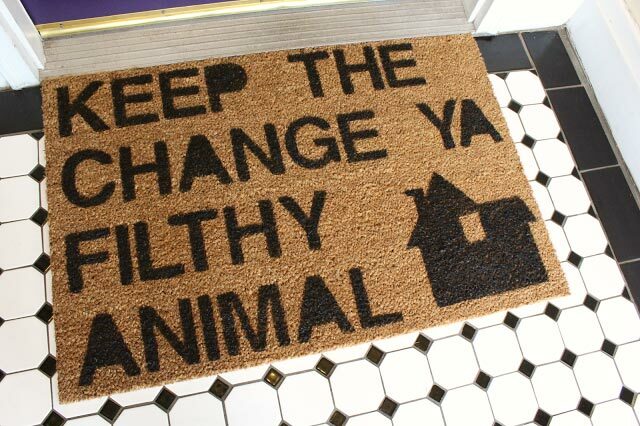 If You Like Home Alone Quotes, You’ll Love Our Doormat. This doormat makes an excellent decoration any time of the year. It’s especially recognizable around Christmas time, though. “Keep the change, ya filthy animal” screams out across the mat in clear script. The phrase was made popular in the movie, “Home Alone”. Of course, that was a quote from an earlier movie, but the decor of this floor mat shows a house in the right hand corner. Any movie buff will be amused with the reference. Millennials might be a bit confused but it will give you a good excuse to introduce them to good movies! This is a great decorative piece for the season or the whole year through. 9. A Quote That’s Short, Sweet, and Simple! I like you very much. It’s a phrase you can’t hear without smiling. This cute quote sounds like something a child might say. But it gives quite a tug at the heartstrings. The lettering is laid out on the lower left corner of an otherwise uncluttered doormat. Don’t let the simplicity fool you, though. We guarantee, none of your guests will be able to squelch a smile when they read it. This doormat is a great addition to any entryway or hallway. 10. A Thoughtful Doormat for Couples in Love. This doormat will completely melt your heart. The quote, “Home is wherever I’m with you” appears centered across the mat in a romantic script. 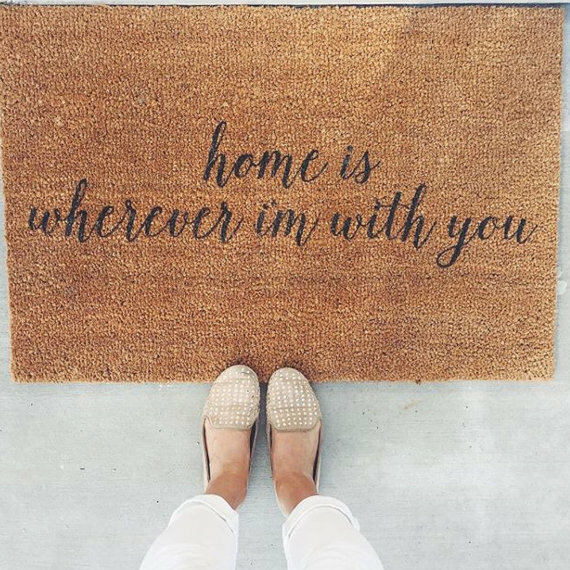 This doormat is the perfect accent piece for the doorway of a couple in love. It makes a great gift for newlyweds. It’s a wonderful reminder of the fantastic relationship two people share. And it highlights the love that built the home within. 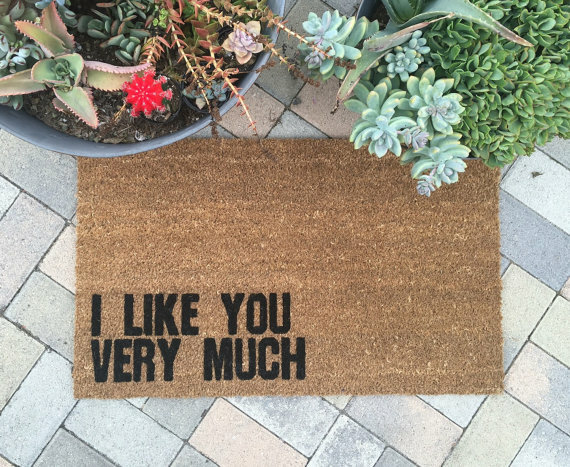 A perfect doormat for those who love showing their love off to the world. 11. Colorful and Bold Text Shaped Doormat! 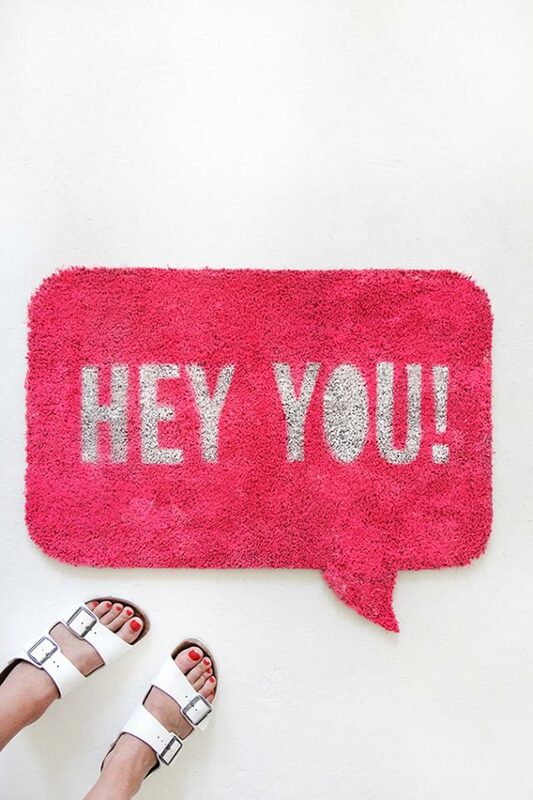 Who couldn’t smile at this bright pink, text shaped doormat? Okay, it’s probably a bit too feminine for some people. But if you like quirky and you love the color pink, you can find the perfect spot for this doormat. The words, “Hey You!” scream across the center of the text box shaped mat. This lets your guest know you’re excited to see them. It’s a message as uplifting as a string of well-placed emoticons. This cute conversation piece makes a great addition for any girls night. It’s also a great find for any woman who enjoys quirky pop culture designs. Your mother put a doormat out to wipe your feet and instructed you to take off your shoes when you came in her house. She was just trying to keep the dirt off her nice, clean floors. But there’s no reason your doormat can’t be funny, too. For your bachelor pad, why not take it a step further? This hilarious doormat reads, “Shoes & Bras Off Please”. Because don’t you want your female guests to be as comfortable as possible? This doormat makes a great gift or conversation piece for any single guy. Married guys should buy at their own risk because their wives might not find it quite as funny. 13. 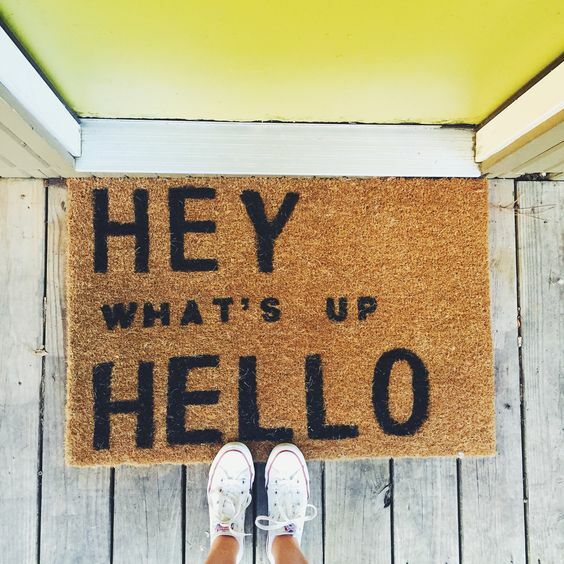 Doormat Greetings to Match Your Mood! Sometimes you’re feeling comfortable and laid back. Other times you need to adopt a more professional appearance. Why should your doormat be any different? This cute, cleanly designed doormat offers three different greetings. There’s, “Hello” for the more formal guests and your mother in law who corrects your grammar. There’s, “Hey” for the neighbor who popped over to drop off something they borrowed. And there’s, “What’s Up” for your goofy college friend who came over for your latest barbecue. Your friends can wipe their feet and choose their own greeting, all at the same time! Anyone who doesn’t quote Yoda really should go away. You don’t need that kind of ignorance. 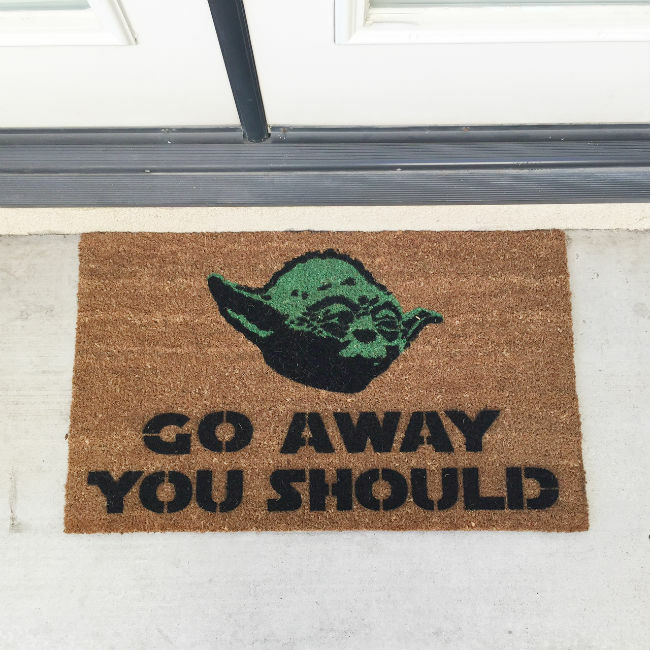 This doormat is for the Star Wars fans who love having a bit of their favorite story depicted in everyday items. It showcases a picture of Yoda. The phrase is written in clear, block lettering. The character never actually said this, but he should have. For the laid back family who loves to showcase their inner geek, this doormat is a great conversation piece. An ambigram is a design that can have two meanings when viewed from different angles. As an art form, they’ve been around for a long time. 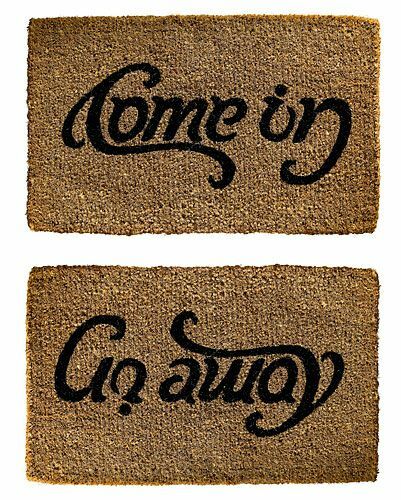 Our lovely, tongue in cheek doormat says, “Come In” when viewed from one side. It says, “Go Away” when seen from the other. 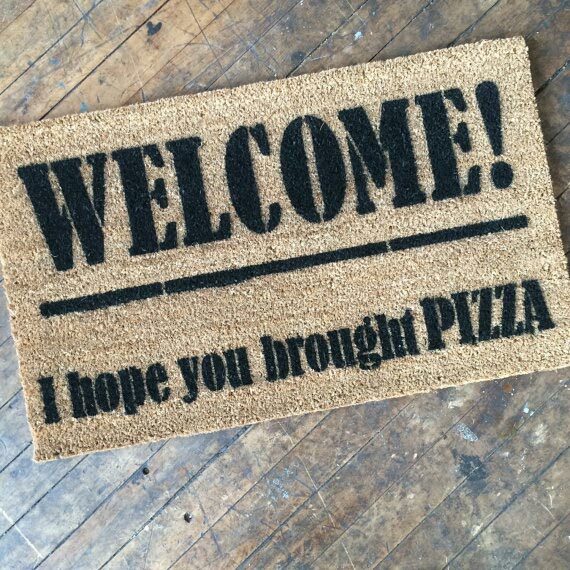 This is a great welcome mat for those guests with a sense of humor. It’s an even better inside joke for those without one. The beautiful thing about this “Come In, Go Away” mat is that it might be sarcasm, or you might be serious. Either way, it fits.